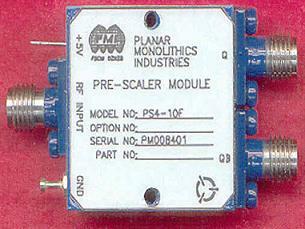 PMI Model PS4-10F is a Low Power, Very High Speed, Pre-Scaler Frequency Divider by 4. The PS4-10F is optimized for operating in the 4 to 10 GHz Frequency Range. This model features a high input sensitivity of -10 dBm @ 10 GHz at 25°C and a Low phase Noise of -139 dBc/Hz at 1 KHz. SMA Female in accordance with MIL-C-39012. Size 1.00" x 1.00" x 0.50"